ALMA antennae bathed in red light. In the background are the southern Milky Way on the left and the Magellanic Clouds at the top. The Magellanic Clouds have been known since the first millennium in Western Asia. The first preserved mention of the Large Magellanic Cloud is by the polymath Ibn Qutaybah (d. 889 CE), in his book on Al-Anwaa (stations of the Moon in pre-Islamic Arabian culture): "وأسفل من سهيل قدما سهيل . وفى مجرى قدمى سهيل، من خلفهما كواكب زهر كبار، لا ترى بالعراق، يسميها أهل تهامة الأعبار And below Canopus, there are the feet of Canopus, and on their extension, behind them bright big stars, not seen in Iraq, the people of Tihama call them al-a`baar." Later Al Sufi, a professional astronomer, in 964 CE, in his Book of Fixed Stars, mentioned the same quote, but with a different spelling. Under Argo Navis, he quoted that "unnamed others have claimed that beneath Canopus there are two stars known as the 'feet of Canopus', and beneath those there are bright white stars that are unseen in Iraq nor Najd, and that the inhabitants of Tihama call them al-Baqar [cows], and Ptolemy did not mention any of this so we [Al-Sufi] do not know if this is true or false.". Both Ibn Qutaybah and Al-Sufi were probably quoting from the former's contemporary (and compatriot) and famed scientist Abu Hanifa Dinawari's mostly lost work on Anwaa. Abu Hanifa was probably quoting earlier sources, which may be just travelers stories, and hence Al-Sufi's comments about their veracity. In Sri Lanka, from ancient times, these clouds have been referred to as the Maha Mera Paruwathaya meaning "the great mountain", as they look like the peaks of a distant mountain range. In Europe, the Clouds were first reported by 16th century Italian authors Peter Martyr d'Anghiera and Andrea Corsali, both based on Portuguese voyages. Subsequently, they were reported by Antonio Pigafetta, who accompanied the expedition of Ferdinand Magellan on its circumnavigation of the world in 1519–1522. However, naming the clouds after Magellan did not become widespread until much later. In Bayer's Uranometria they are designated as nubecula major and nubecula minor. In the 1756 star map of the French astronomer Lacaille, they are designated as le Grand Nuage and le Petit Nuage ("the Large Cloud" and "the Small Cloud"). Herschel in 1847 from Cape Observatory South Africa spent 4 years writing a 400-page report detailing over a thousand of the many stars, nebulae and clusters which constitute the cloud which appeared to be a separate more distant group to the usual stars in the Milky Way, an early indication of separate galaxy. The Large Magellanic Cloud (LMC). The Large Magellanic Cloud and its neighbour and relative, the Small Magellanic Cloud, are conspicuous objects in the southern hemisphere, looking like separated pieces of the Milky Way to the naked eye. Roughly 21° apart in the night sky, the true distance between them is roughly 75,000 light-years. Until the discovery of the Sagittarius Dwarf Elliptical Galaxy in 1994, they were the closest known galaxies to our own (since 2003, the Canis Major Dwarf Galaxy was discovered to be closer still, and is now considered the actual nearest neighbor). The LMC lies about 160,000 light years away, while the SMC is around 200,000. The LMC is about twice the diameter of the SMC (14,000 ly and 7,000 ly respectively). For comparison, the Milky Way is about 100,000 ly across. The total mass of these two galaxies is uncertain. Only a fraction of their gas seems to have coalesced into stars and they probably both have large dark matter halos. One recent estimate of the total mass of the LMC is about 1/10 that of the Milky Way. That would make the LMC rather a large galaxy in the current observable universe. Since the size of relatively nearby galaxies are highly skewed, the average mass can be a misleading statistic. In terms of rank, the LMC appears to be the fourth most massive member of over 50 galaxies in the local group. 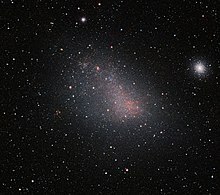 Suggesting that the Magellanic cloud system is historically not a part of the Milky Way is evidence that the SMC has been in orbit about the LMC for a very long time. The Magellanic system seems most similar to the distinct NGC 3109 system, which is on the edge of the Local Group. Astronomers have long assumed that the Magellanic Clouds have orbited the Milky Way at approximately their current distances, but evidence suggests that it is rare for them to come as close to the Milky Way as they are now. Observation and theoretical evidence suggest that the Magellanic Clouds have both been greatly distorted by tidal interaction with the Milky Way as they travel close to it. The LMC maintains a very clear spiral structure in radio-telescope images of neutral hydrogen. Streams of neutral hydrogen connect them to the Milky Way and to each other, and both resemble disrupted barred spiral galaxies. Their gravity has affected the Milky Way as well, distorting the outer parts of the galactic disk. Aside from their different structure and lower mass, they differ from our galaxy in two major ways. First, they are gas-rich; a higher fraction of their mass is hydrogen and helium compared to the Milky Way. They are also more metal-poor than the Milky Way; the youngest stars in the LMC and SMC have a metallicity of 0.5 and 0.25 times solar, respectively. Both are noted for their nebulae and young stellar populations, but as in our own galaxy their stars range from the very young to the very old, indicating a long stellar formation history. The Large Magellanic Cloud was host galaxy to a supernova (SN 1987A), the brightest observed in over four centuries. Measurements with the Hubble Space Telescope, announced in 2006, suggest the Magellanic Clouds may be moving too fast to be long term companions of the Milky Way. If they are in orbit, that orbit takes at least 4 billion years. They are possibly on a first approach and we are witnessing the start of a galactic merger that may overlap with the Milky Way's expected merger with the Andromeda Galaxy (and perhaps the Triangulum Galaxy) in the future. Astrophysicists D. S. Mathewson, V. L. Ford and N. Visvanathan proposed that the SMC may in fact be split in two, with a smaller section of this galaxy behind the main part of the SMC (as seen from Earth's perspective), and separated by about 30,000 light years. They suggest the reason for this is due to a past interaction with the LMC splitting the SMC, and that the two sections are still moving apart. They have dubbed this smaller remnant the Mini Magellanic Cloud. ^ "Media Advisory: Virtual Press Conference to Mark ALMA Inauguration". ESO. Retrieved 3 April 2013. ^ a b Allen, R. H. (1963). Star Names: Their Lore and Meaning (Reprint ed.). New York, NY: Dover Publications Inc. pp. 294–295. ^ "Al-Anwaa, Ibn Qutaybah". Retrieved 4 Sep 2017. ^ "Observatoire de Paris (Abd-al-Rahman Al Sufi)". Retrieved 22 July 2011. ^ "Book of Fixed Stars, Al-Sufi (manuscript written and illustrated by his son)". Retrieved 22 Feb 2017. Humboldt, Alexander von, with E.C. Otte and B.H. Paul, trans., Cosmos: A Sketch of a Physical Description of the Universe (London, England: Henry G. Bohn, 1852), vol. 4, pp. 340–341. See also: Kanas, Nick, Star Maps: History, Artistry, and Cartography, 2nd ed. (New York, New York: Springer Science + Business Media, 2012), § 4.3.2.2 Andreas Corsali, p. 118. ^ Pigafetta et al., with Lord Stanley of Alderley, trans., The First Voyage Round the World, by Magellan … (London, England: Hakluyt Society, 1874), p. 66. From p. 66: "The antarctic pole is not so covered with stars as the arctic, for there are to be seen there many small stars congregated together, which are like to two clouds a little separated from one another, and a little dimmed, … "
^ "A Cosmic Zoo in the Large Magellanic Cloud". European Southern Observatory. 1 June 2010. Retrieved 29 August 2010. ^ Macri, L. M.; et al. (2006). "A New Cepheid Distance to the Maser-Host Galaxy NGC 4258 and Its Implications for the Hubble Constant". The Astrophysical Journal. 652 (2): 1133–1149. arXiv:astro-ph/0608211. Bibcode:2006ApJ...652.1133M. doi:10.1086/508530. ^ "Little Galaxy Explored". Jet Propulsion Laboratory, California Institute of Technology. 5 January 2010. Retrieved 29 August 2010. ^ Ferris, Timothy (December 2011). "Dancing in the Dark". National Geographic. 220 (6): 118. ^ "Press release: Magellanic Clouds May Be Just Passing Through". Harvard University. January 9, 2007.